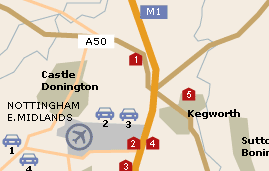 Airport Parking offers a wide range of options for parking at East Midlands Airport. With both on and off-airport options, there will be something on offer to suit every need and budget. For a quote please click here. So as well as being a more convenient option, it may also be easier on your finances. To view the hotels on offer at East Midlands Airport and get a quote please click here. High chairs, bottle warming service, colouring pads and crayons, children's meals and party packs available at the Trent Café. Child friendly areas in bars with high chairs, no smoking and TV. Toys and games available in Dominoes Toys. Rascal Rabbit Kids Club for children up to the age of 12.